You’re sitting in class with your schoolbag packed up 20 minutes ago, waiting for the last bell to go off so that you can burst out the classroom door. Your teacher is eyeing on you and before she can finish her sentence, the school bell cuts her off and everyone flood the hallway. Trips to the neighborhood mall were planned via BBM or MSN with your friends. Lunch at McDonald’s and even catching a movie were such a treat during any of these outings. If our parents cannot give us a ride, we’ll have to brave ourselves by taking Metro bus or taxi to the mall. The best feeling is when you bump into your peers or school teachers without your uniform on, so no one is getting into any trouble! Church camp, school camp, tuition camp, parents-signed-you-up-to-make-you-a-better-child camp. Aside from the dreadful packing for the trip and involuntary involvement in the activities, we usually walked away with good friends and great memories. If you were one of the lucky ones, you probably have had a Gameboy, Nintendo DS or the king of it all, the Sony PSP to see you through your school holidays. The best part is that everyone will try to get themselves invited to your house so that they get to enjoy the games too. So it’s nice to show off your collection of games to them while you’re at it. Rest day is out of question if you’re sitting for PTS, UPSR, PMR or SPM during the next school term. Our parents have invested a good sum during the school break just to ensure that we have a better head start but let’s face it, we’ve ponteng these intensive tuition classes once or twice just so that you can lepak with your friends. Don’t worry, your secret’s safe with us. 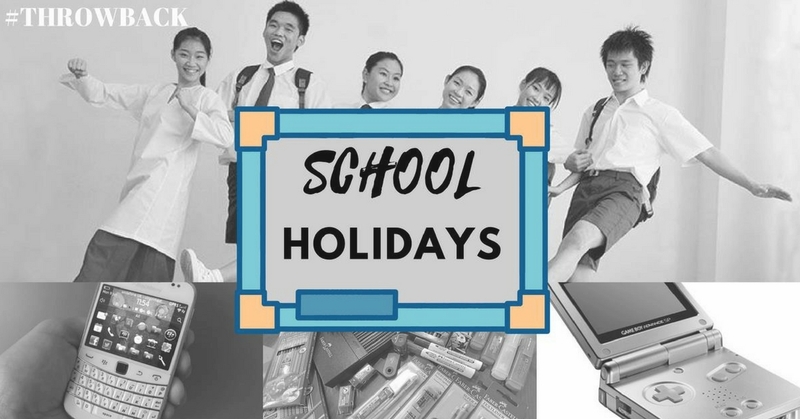 Year end school holidays were the time where most parents have saved up enough money to bring then entire family for the best trip of the year. Even if it was just visiting another states in Malaysia, they’d make sure that they spend more time and patience with us kids by bringing us to the best places to eat. Relatives from near and far will drop by for a visit too. Sometimes our parents will let us spend the week with our cousins and grandparents and that’s where all the epic childhood stories were created. Trips to the bookstore were the best. Of course you need 5 mechanical pencils and 7 different colour pens to make your school year more bearable. Revision books (that you would probably only use halfway)? YES PLEASE. You’ll also sneak in some brand new stickers which will be added to your busting collection of stickers which you’re not quite sure where it all went after all these years. What else do you remember doing during your school holiday break?